The City of Spirit Lake welcomes new businesses. We also want existing businesses to be successful. The City Council and City Administration strive to promote a good business climate and to make the community inviting for customers and employees. Programs to support business development are often tied closely to State of Iowa programs offered through the Iowa Department of Economic Development. The Iowa Lakes Corridor Development Corp. is instrumental in connecting with these State programs. In addition, the City has a tax abatement program for new industrial/commercial development and has recently implemented a design incentive program to provide grants for upgrading downtown storefronts in accordance with design guidelines. Spirit Lake has a population of 4,840 but we are much bigger than that. During peak tourist seasons and special events, tens of thousands of visitors and seasonal residents are in the City and Lakes area at any point in time. The tourist/recreation activities, employment base, and shopping opportunities make Spirit Lake a commercial center for retail and other businesses. 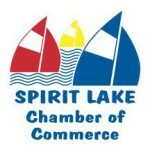 Spirit Lake is part of a combined “small metro area”. Unlike most small towns, we are part of six communities that are adjacent to each other in the Lakes Area. Our combined 2010 population is 10,301 in the adjacent cities of Spirit Lake, Okoboji, Arnolds Park, Milford, West Okoboji and Wahpeton. The total population of Dickinson County, is 16,667. The City Council has approved the 2009 Comprehensive Plan for Spirit Lake and Future Land Use Map. This plan and map will guide future developments for business and commercial activities as well as other policies. See the Community Development section for more information.